Two young men and two young women share an apartment in Tokyo. Koto barely ventures out into the world, waiting by the phone for her TV star boyfriend to ring. Ryosuke attends a private college and is having an affair with his friend’s girlfriend. Mirai manages a shop and spends her spare time either drawing illustrations or partying all night in gay bars. Naoki works for a film distributor, is a long distance runner, and is frequently drunk. One day Satoru, a homeless youth, turns up and moves in. Nobody is quite sure where he came from or what he does, but he’s soon accepted as part of their world. As they’re lives unfold, they speculate on the strange comings and goings from the apartment next door and the attacks against women in the area. 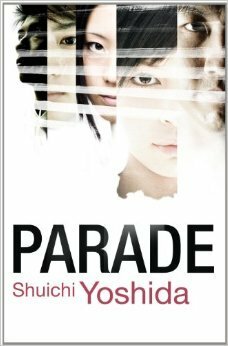 Parade is somewhat of a curious book. It is marketed as crime fiction, with a tagline of ‘A masterpiece in tension’, yet crime is almost incidental to the story and there is practically no tension in the story or its telling. Instead, Parade is a literary novel about alienation and estrangement in modern society; of not quite fitting in, of lacking direction and purpose, of desiring what cannot be obtained. While the timeline is linear, each of the chapters is told from the perspective of five people sharing an apartment, each of whom has kind of drifted into living there. Each is told in the first person, with the character reflecting on their own life – their history and ambitions, their relationships with others – and setting out their view of the world. In this way, a wider narrative about the interactions and friendship between the five is examined, as well as Japanese society more broadly. It was a sombre rather than tense read, a kind of literary soap opera of urban alienation which, for the most part is a thoughtful reflection on modern life.